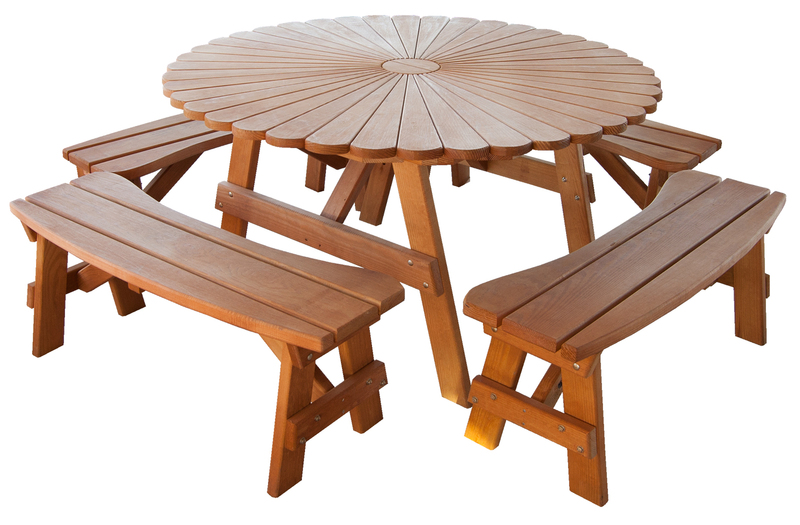 Offering the Finest Wooden and Poly Patio Furniture on the Market! 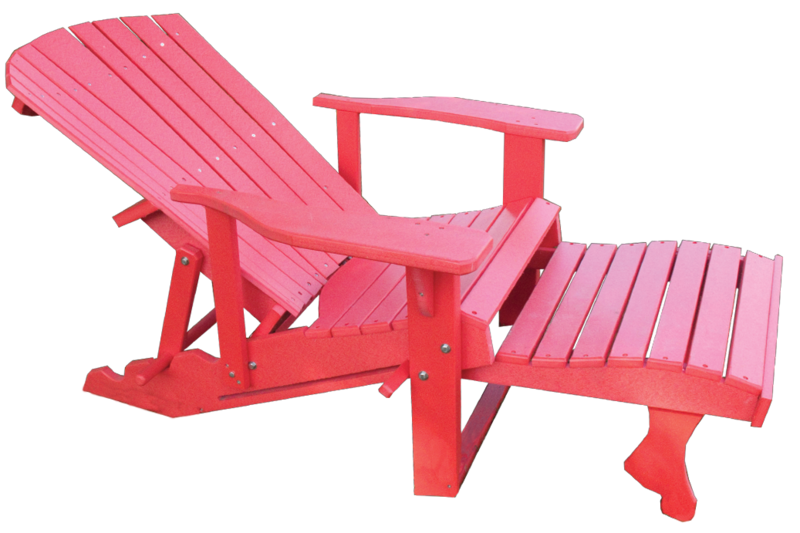 Our Amish-Crafted outdoor patio furniture's beauty and durability will never end! 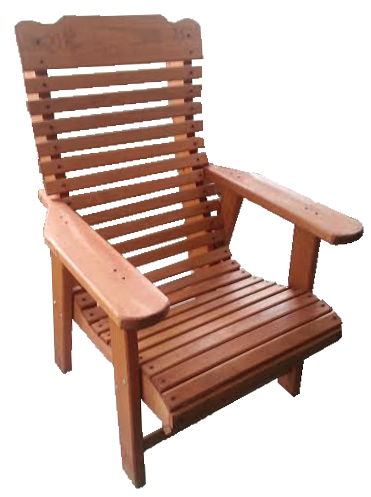 Our pressure treated pine wooden patio furniture is stained and sealed to perfection. 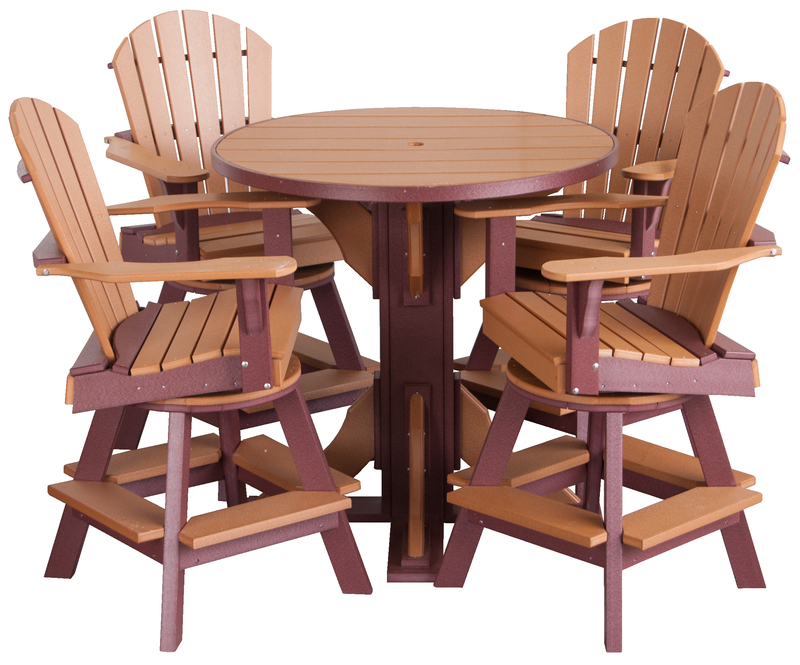 Or go eco-friendly... Our Amish-Crafted poly patio furniture is manufactured with 100% recycled plastic and will look brand new for a lifetime. See all your options below. 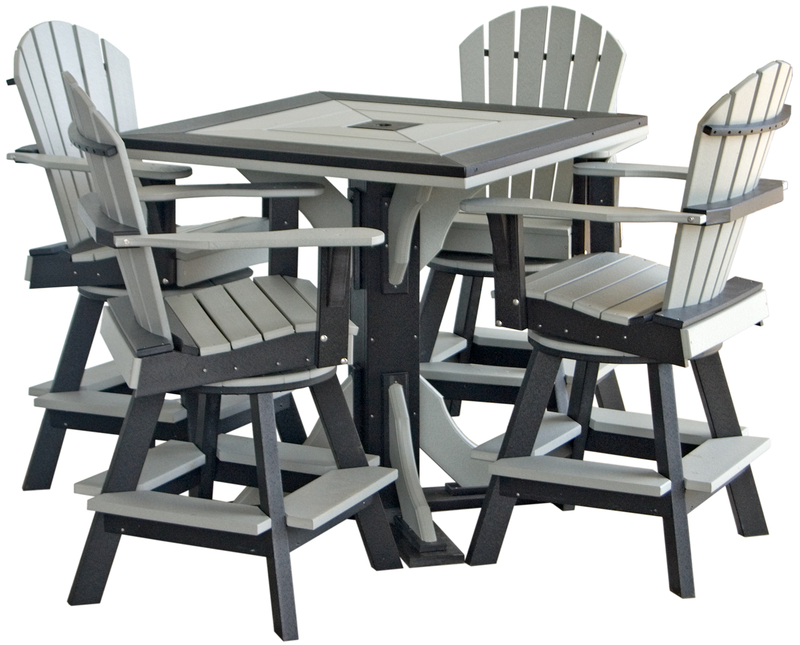 Our Amish-Crafted poly patio furniture is manufactured with 100% Recycled Plastic. 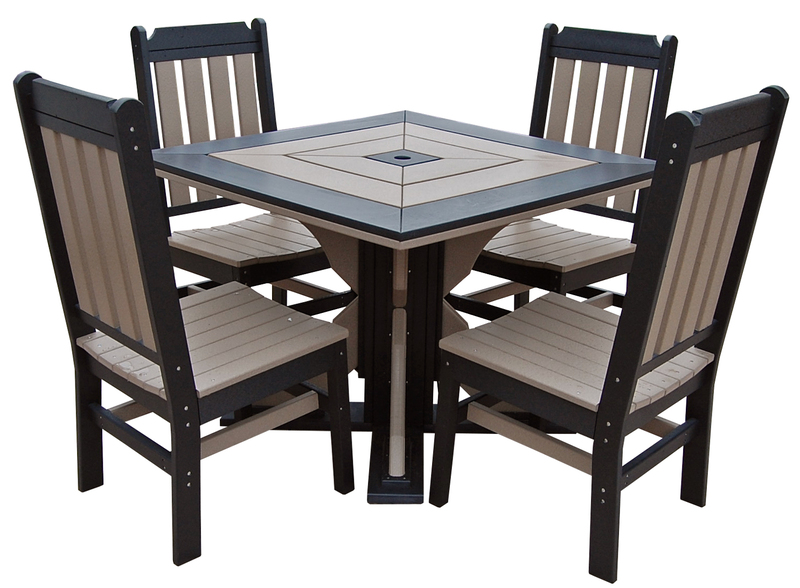 This beautiful patio furniture is fade resistant, won't scratch or split, and is completetly water resistant; backed by a lifetime manufacturer's warranty. 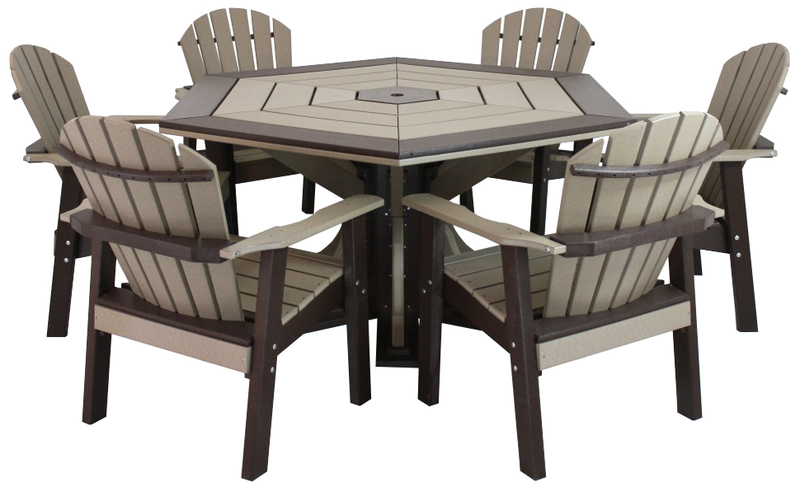 Poly patio furniture does NOT absorb water and dries within minutes. No need to store it for the winter. 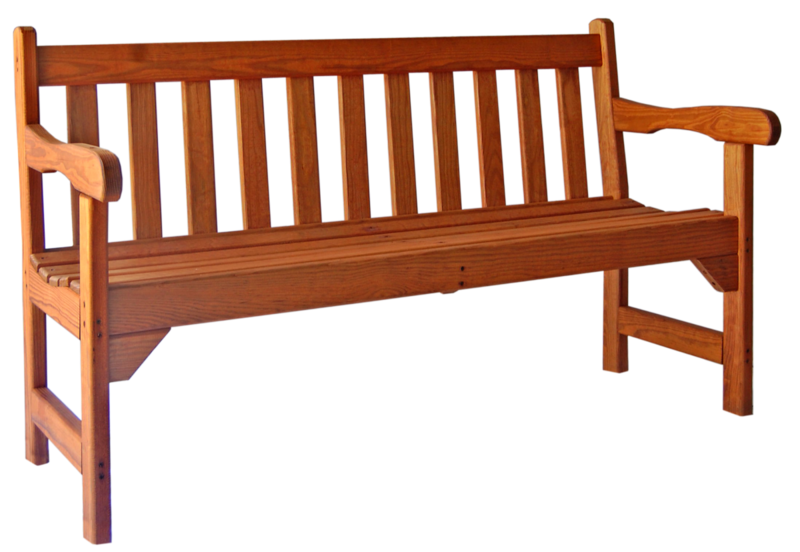 You can leave out all year long. 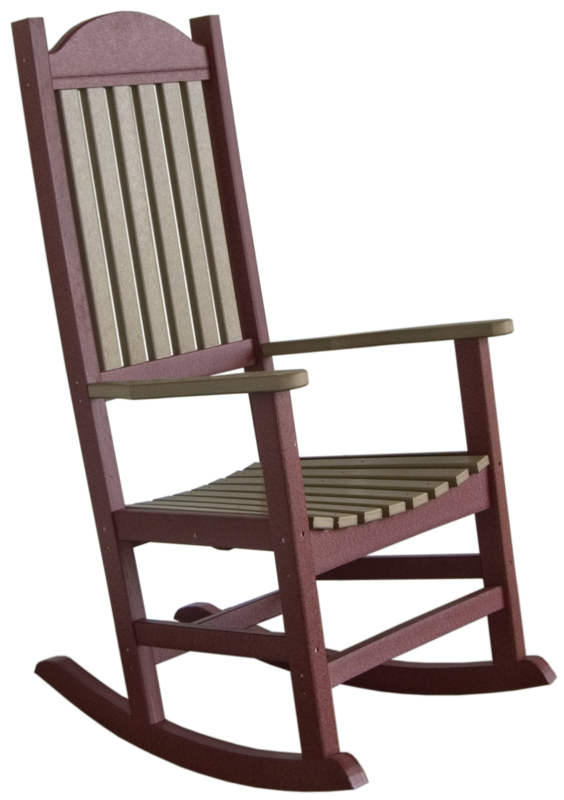 It will look brand new for a lifetime! 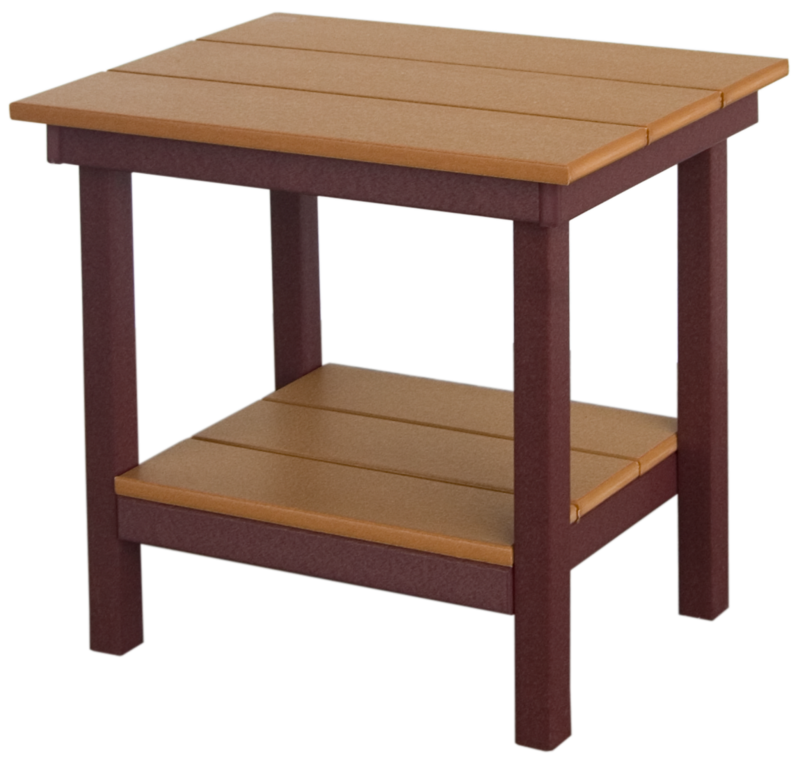 Poly patio furniture is maintenance free and available in 20 exciting colors! 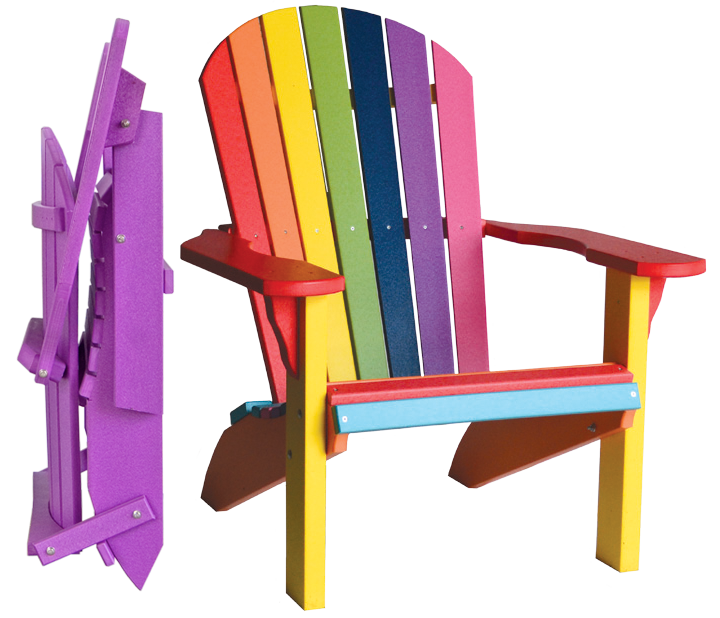 Explore all of the color choices below! 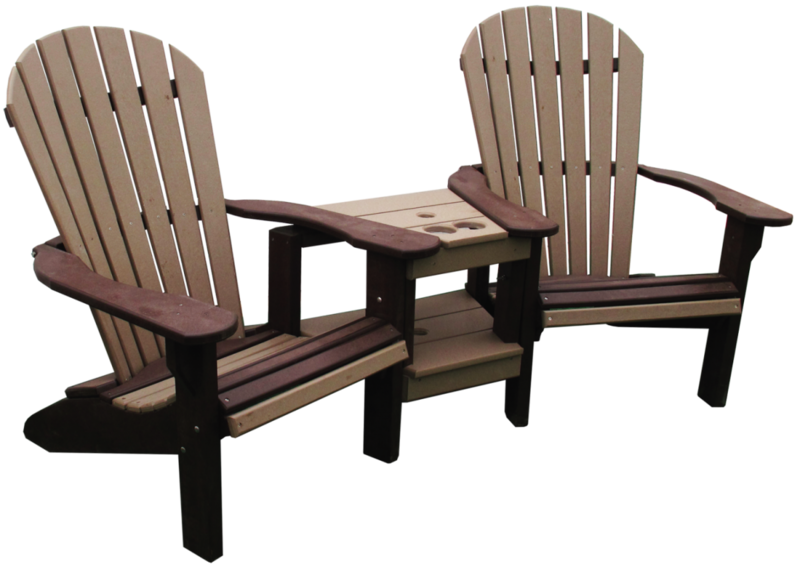 Perfectly for inside a circle of Adirondack Chairs! 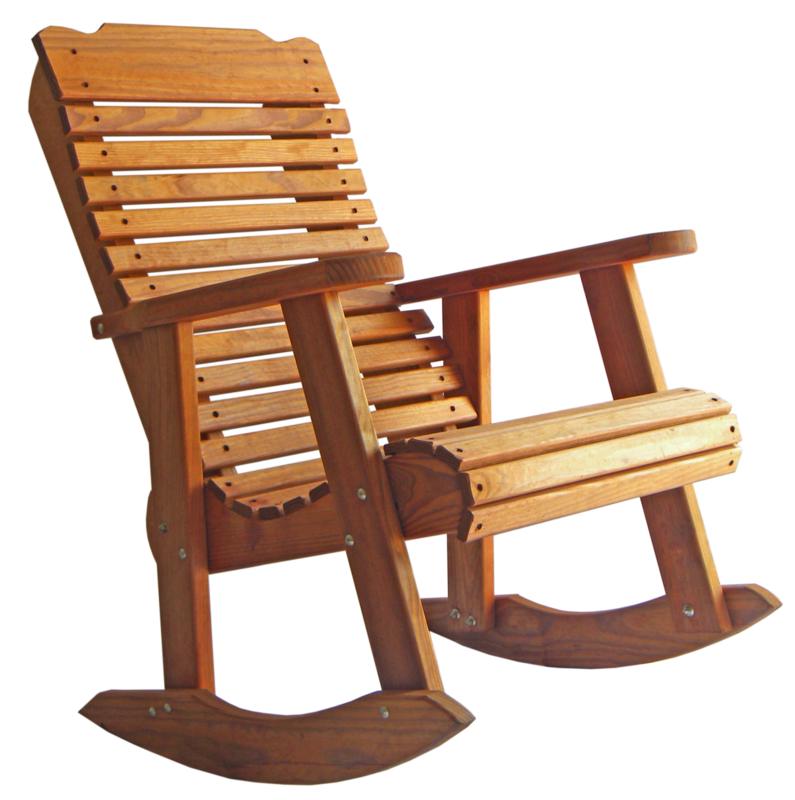 Perfect for between two pub chairs! 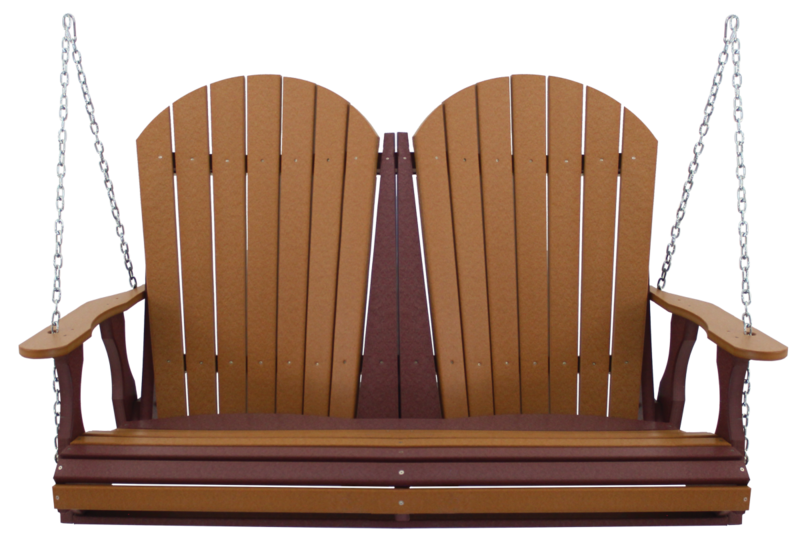 Accommodates one 4' or 5' Swing. 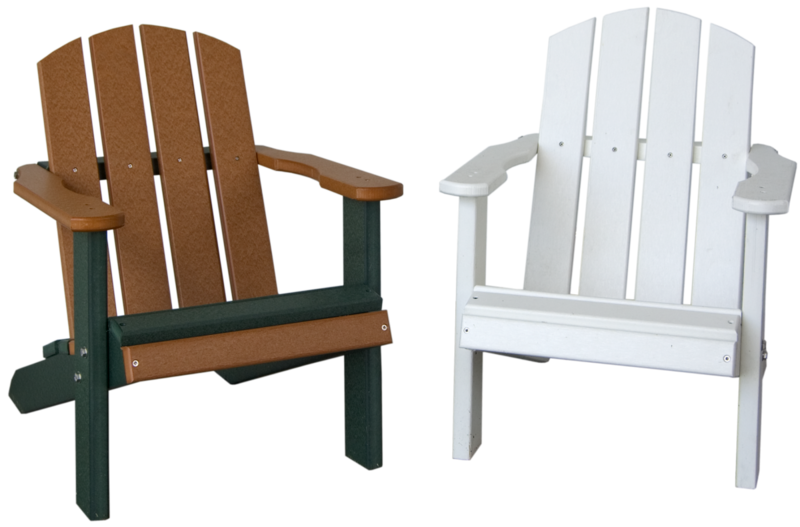 Available in white or clay. 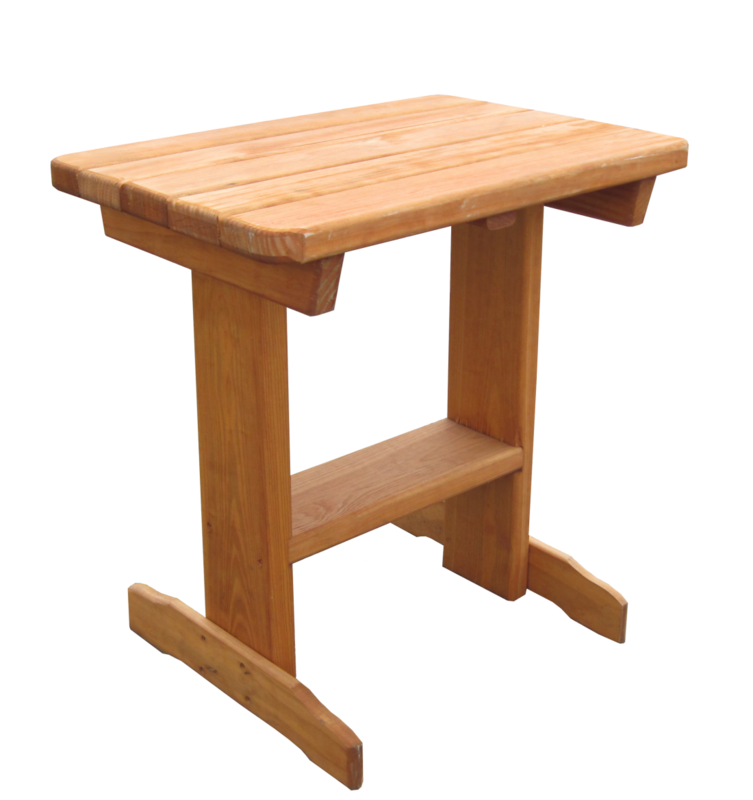 Tables are available in two heights: Dining or Pub. 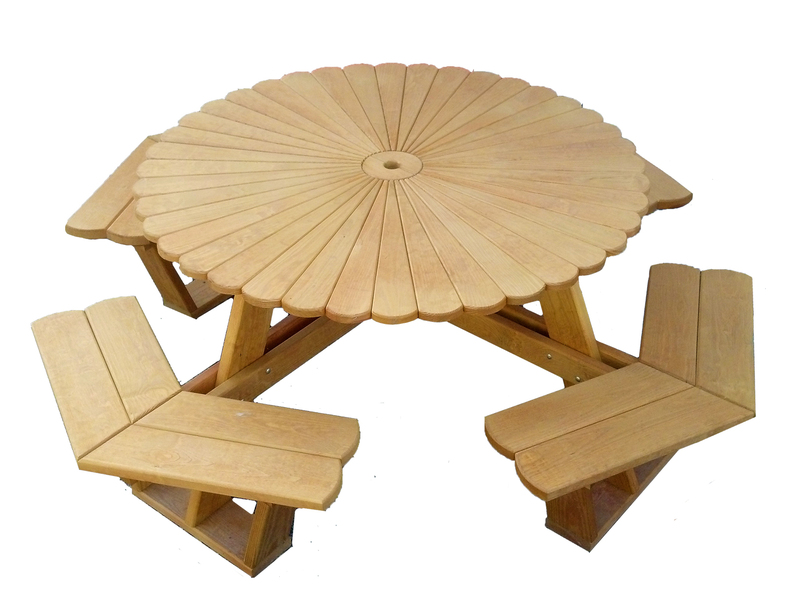 Tables and Chairs sold separately. 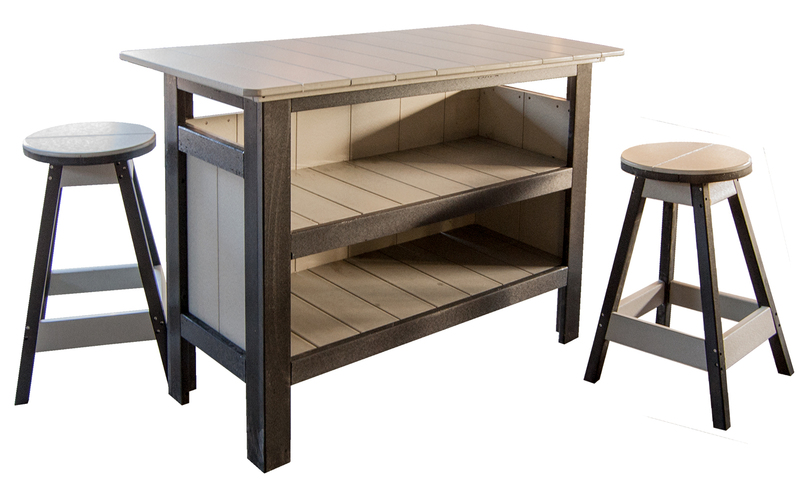 Bar and Stools sold separately. 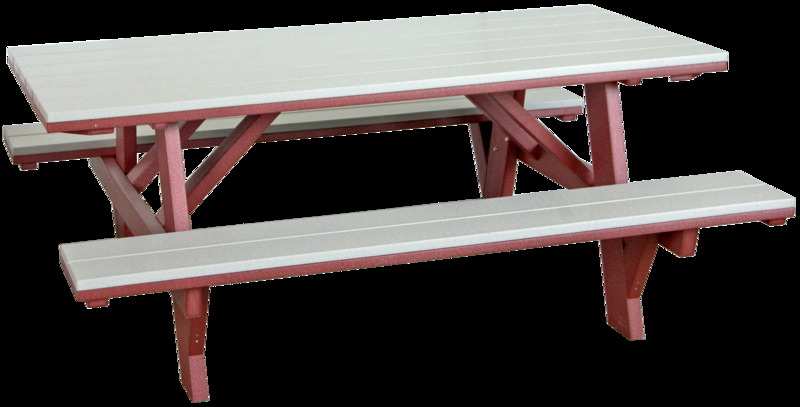 *Tables and Benches sold separately. 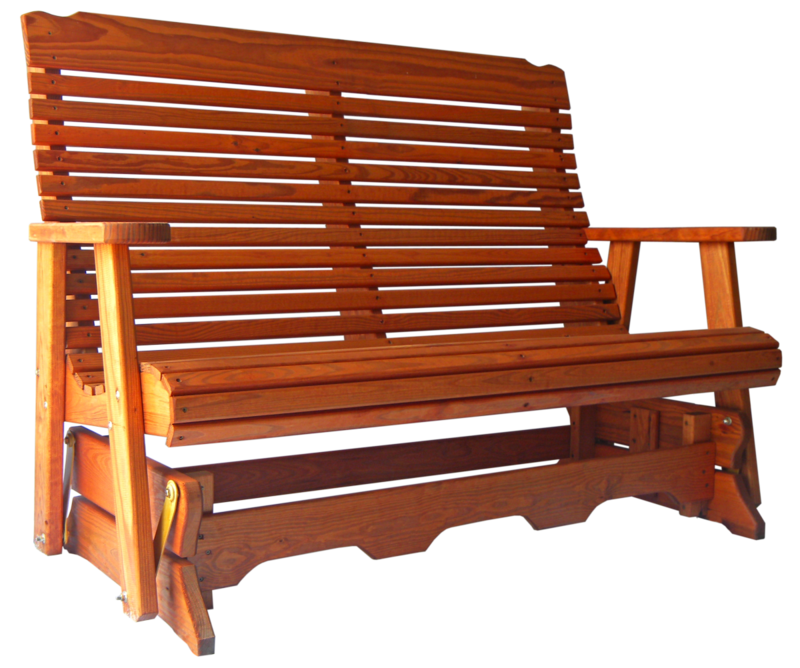 Our Amish-Crafted wooden patio furniture is stained and sealed to perfection. 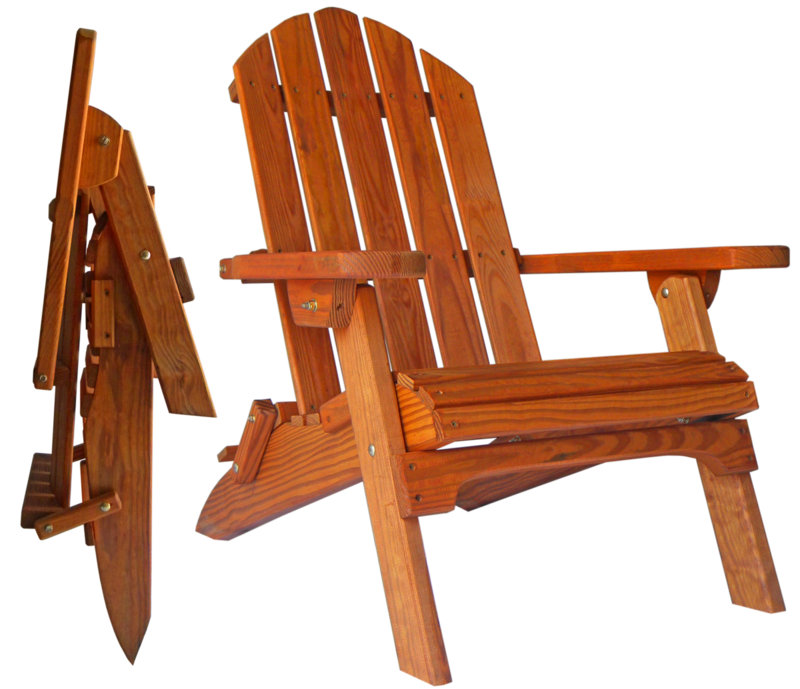 our wooden patio furniture's beauty and durability will never end! 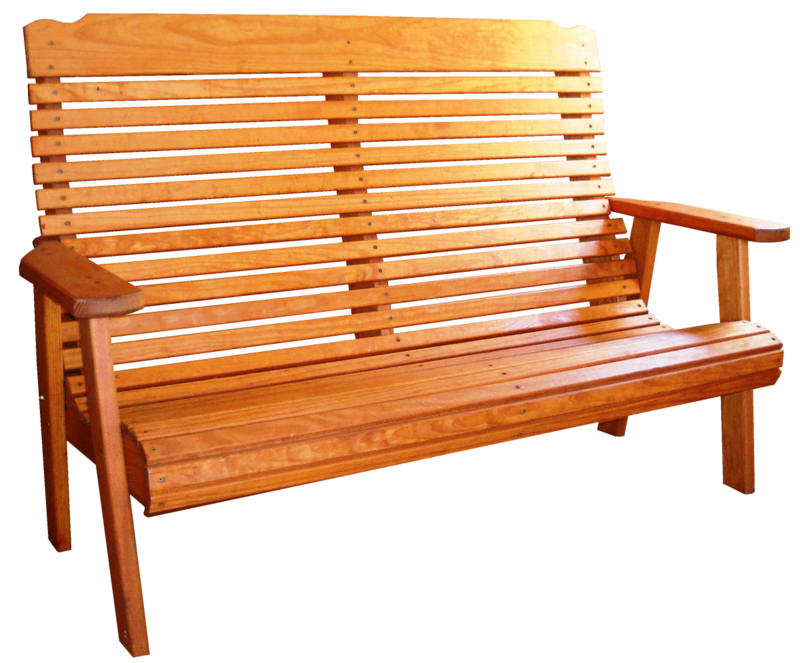 Wooden patio furniture staining and sealing is included in the listed price. 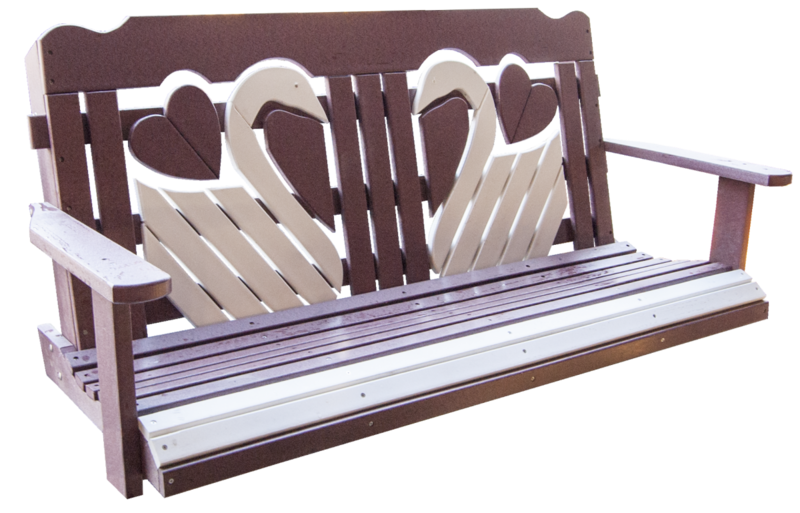 Separate benches available with or without backs. 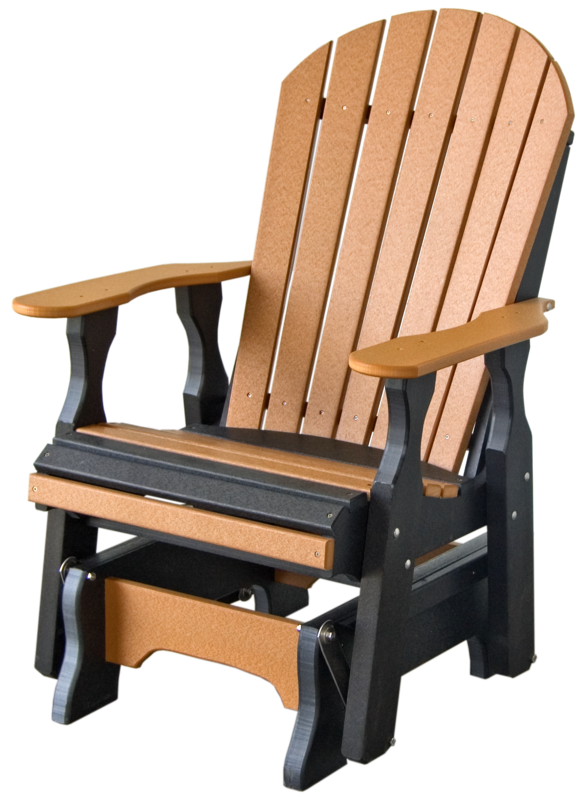 Ask your local sales manager for more details, sizes, and pricing. 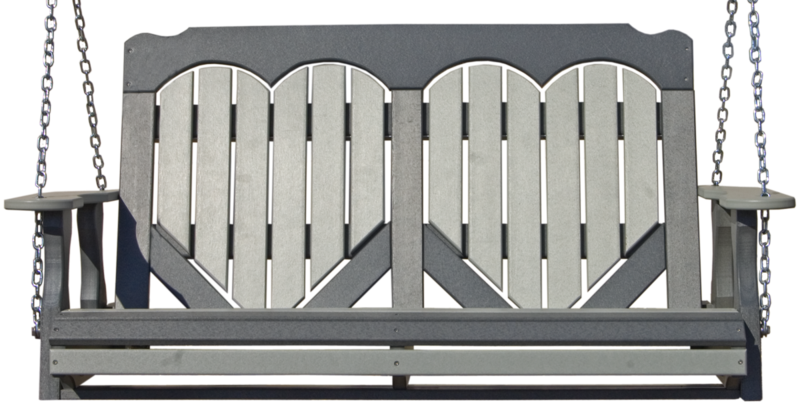 Discover the value of Pine Creek Structures! See why we're different below. 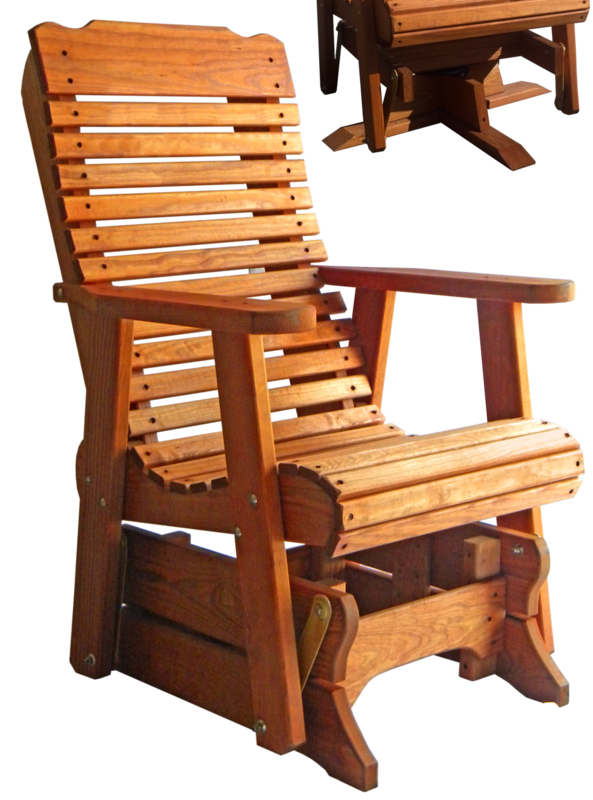 Which Seat Is Right For YOU? 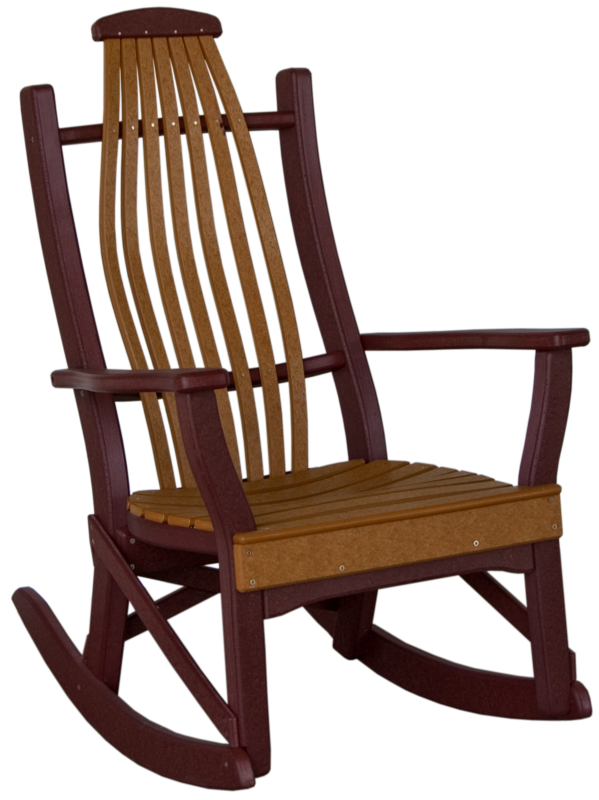 Let Pine Creek Structures help you decide which chair, glider, or swing is right for you! 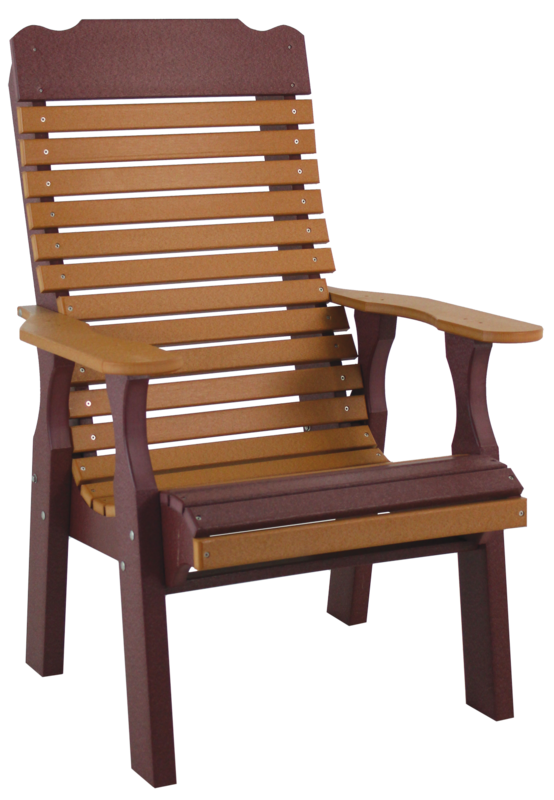 Countoured seats are molded to the curves of your body and have a higher back for total relaxation and comfort! 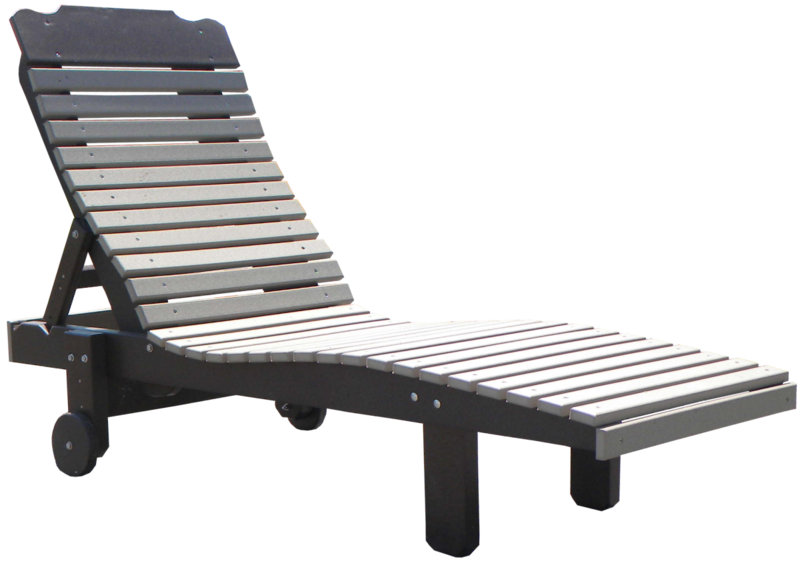 Fanback seats are curved to cradle your body, providing individual comfort. 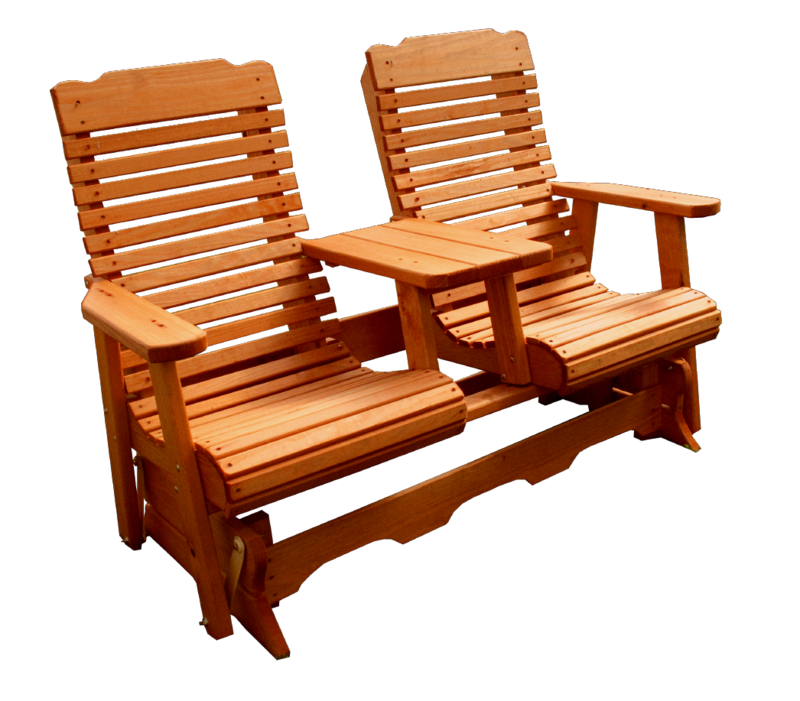 No more fighting over who's taking more than their half of the swing or glider! 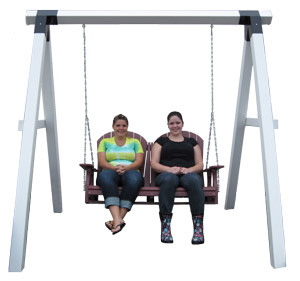 A 4-foot swing or glider can comfortably accommodate two average size adults, as seen above. 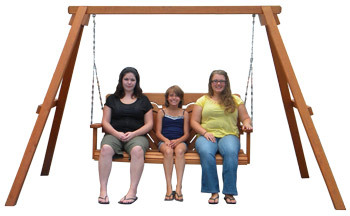 A 5-foot swing or glider can comfortably accommodate one child and two average size adults, as seen above. 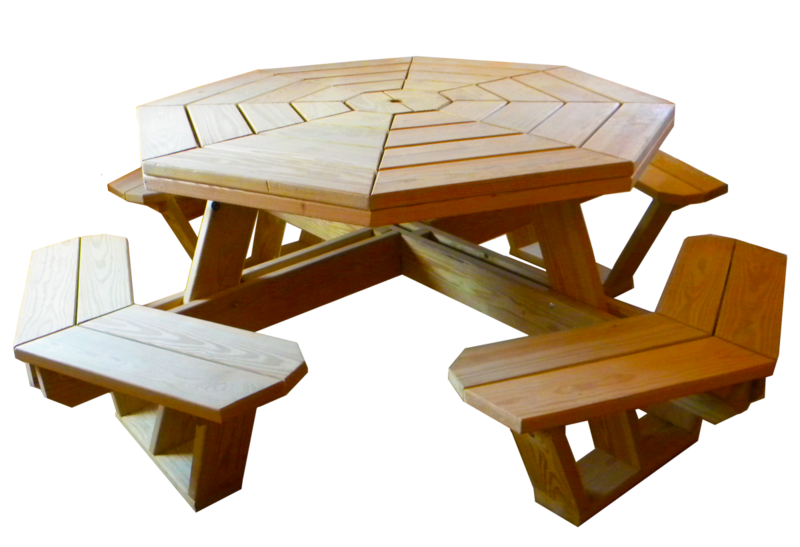 Custom size furniture also available! 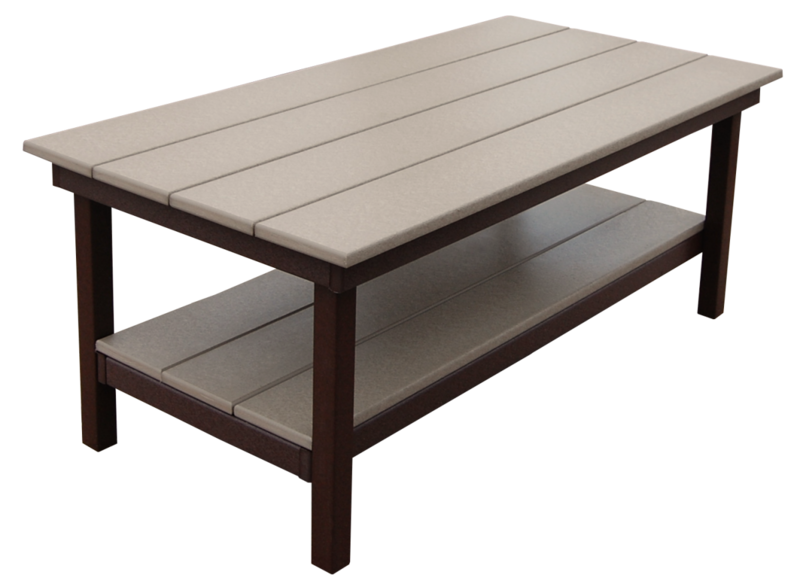 Contact your local sales lot representative for more information. 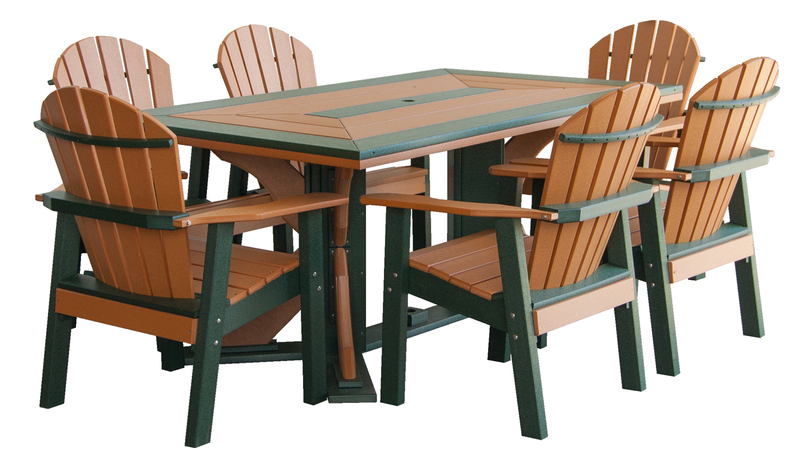 Poly patio furniture is available in 20 exciting colors. 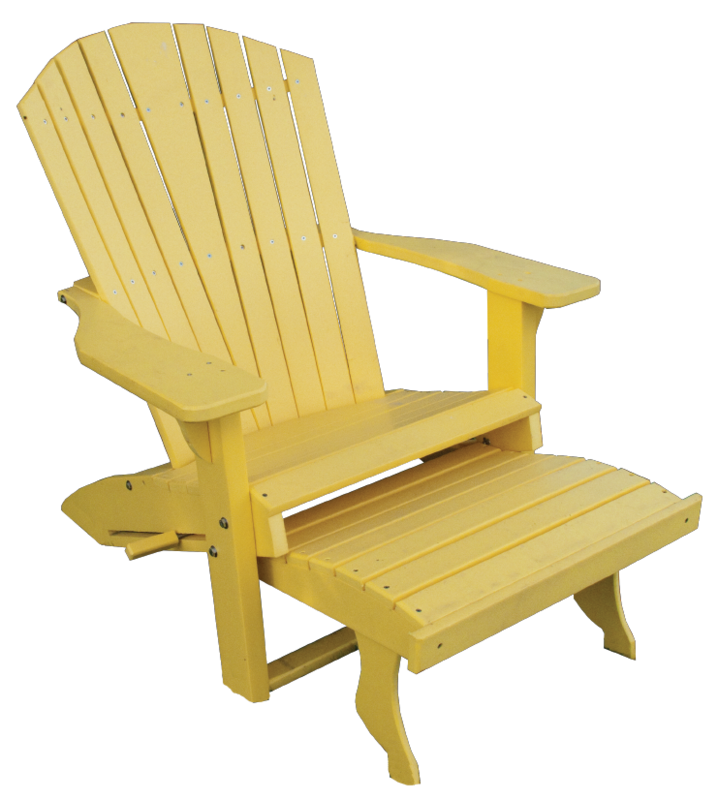 Explore all of the color choices! 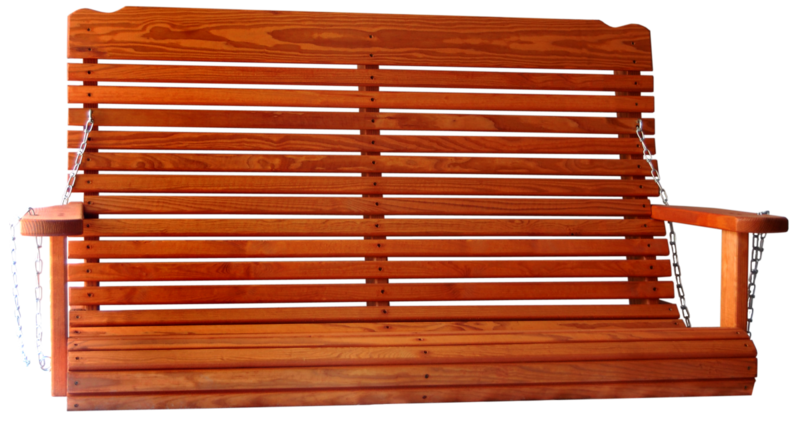 These colors include a woodgrain texture for the appearance of wood, with the strength and durability of poly lumber! 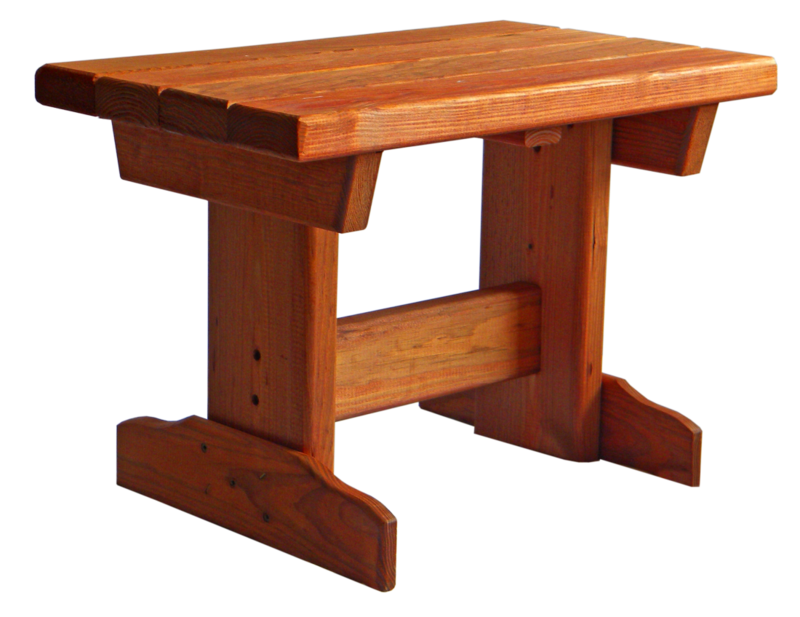 If choosing a rustic color for your furniture, add 15% to list price. *Colors may vary due to computer screen differences. 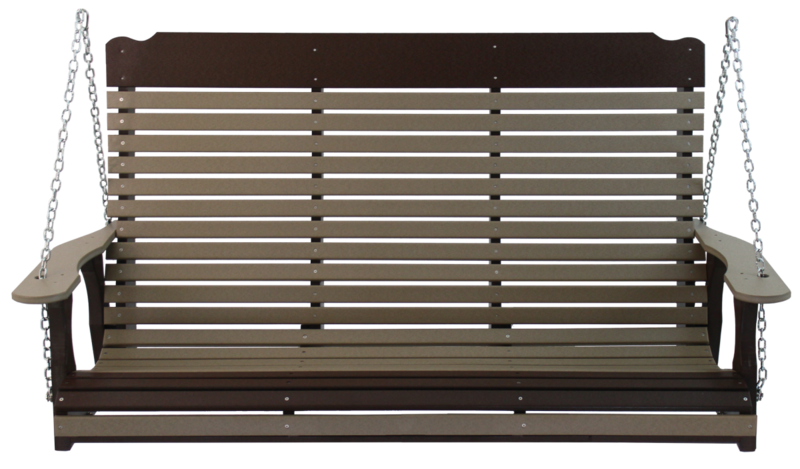 Contact your local sales lot manager for exact color matching and standard color pairs. 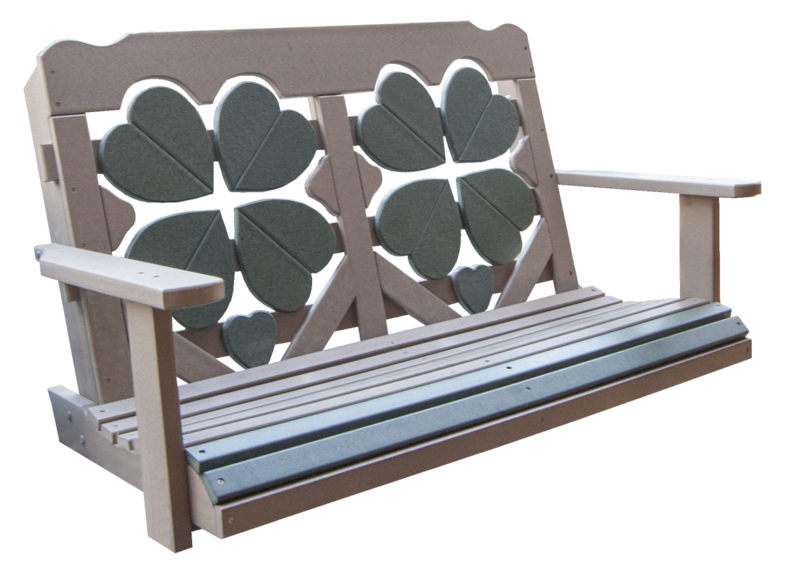 Looking for more outdoor decorations? 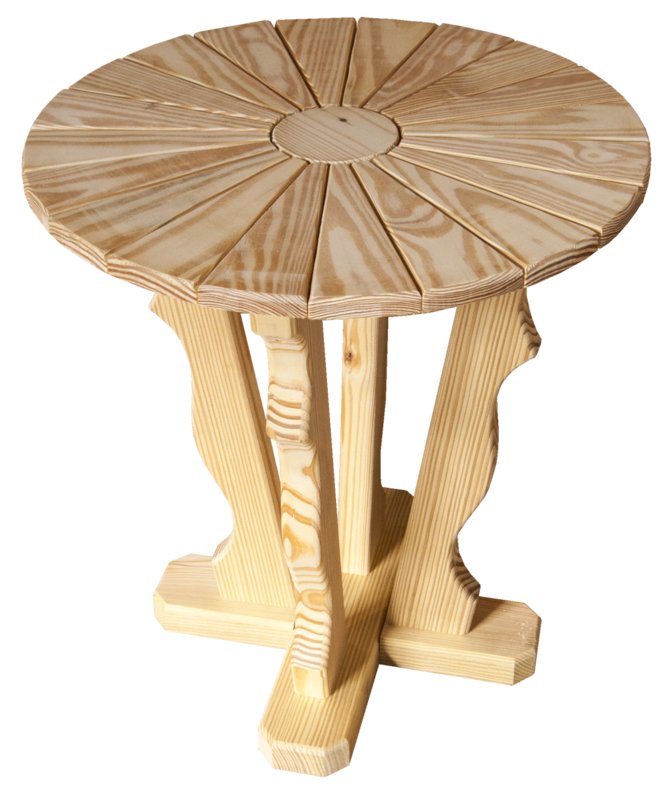 Bird Feeders, Lighthouses, and much more.